We’ve been eating a TON of fish lately, especially salmon! It’s a good thing our household loves salmon and our bodies THRIVE off those healthy fish omegas! But not everyone would agree. I know many and adults (and their kids) who are afraid to try fish or turn their nose up at it even though fish SUPER HEALTHY for you. Their reasoning is that they either don’t know how to cook fish, think it’s too complicated, or just can’t stand the taste and/or smell. I guess I don’t blame them. If you try a “fishy” fish, it’s hard to keep trying other fish. But here’s a tip, quality fish should be FRESH and not smell that fishy. And quality fish is even HEALTHIER for you because it’s higher in omega-3 fatty acids, referred to as alpha-linolenic, EPA, and DHA. These omegas-3 fatty acids are especially crucial for kids! Research has shown that kids who consumed Omega-3 fatty acids had an increase in cognitive function. Which basically means it improved their focus and brain health. Yes, that’s a MUST for those kiddos! (source). That being said, how the heck do we get the whole family on the healthy fish eating train? Well, we get creative and bring out the “healthy” comfort food. 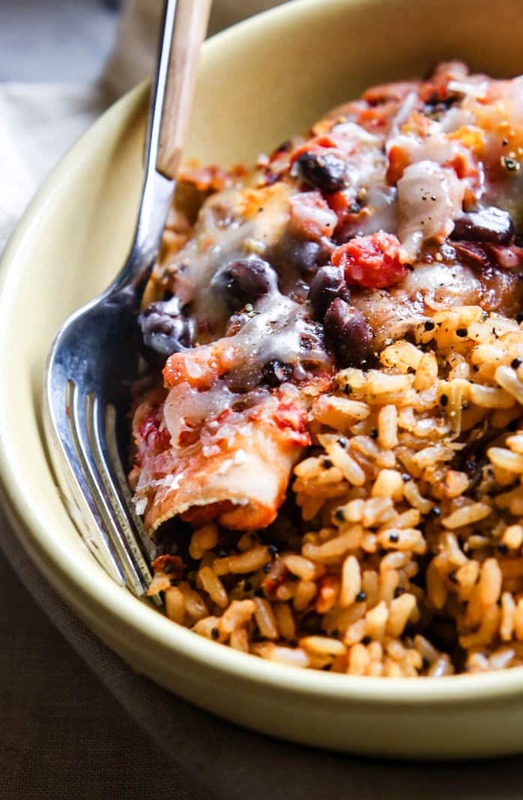 Healthy comfort food like salmon baked bean burritos! And to make it more fun, we make the burritos into “bowls,” because let’s face it, BOWLS are so popular right and easier to eat out of. 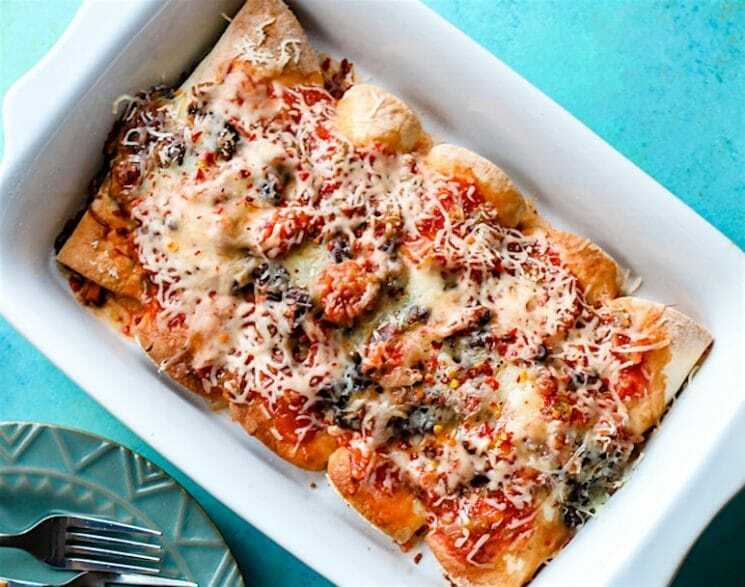 This healthy kid friendly fish dish is super easy to make and can feed a crowd. Preparation of the ingredients can be made easier and quicker using the right kitchen tools. You can use wild caught canned salmon (if you have a fear of cooking fish) or use fresh salmon. When you bake the salmon with all the other wonderful mexican flavors, you can barely taste the fish yet you get all it’s health perks. It’s a win win for the whole family! 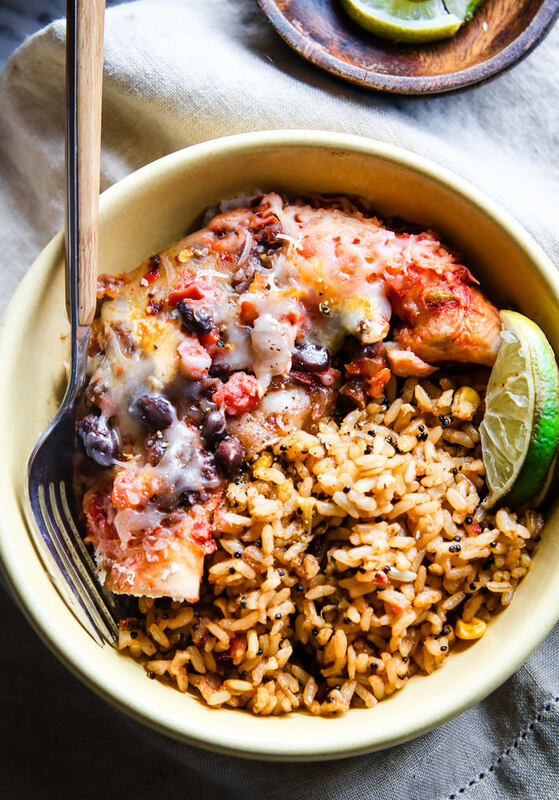 Salmon is our key omega source in this baked bean burrito bowl dish and it deserves a little more bragging. WHAT MAKES Salmon SO HEALTHY? High in the omega-3 fatty acids EPA and DHA, as mentioned above. Which has tremendous heart and brain health benefits. Cold water fish – higher in good fats, which can lower blood pressure and improve overall blood cholesterol levels. Okay fish phobia families, what do you think? 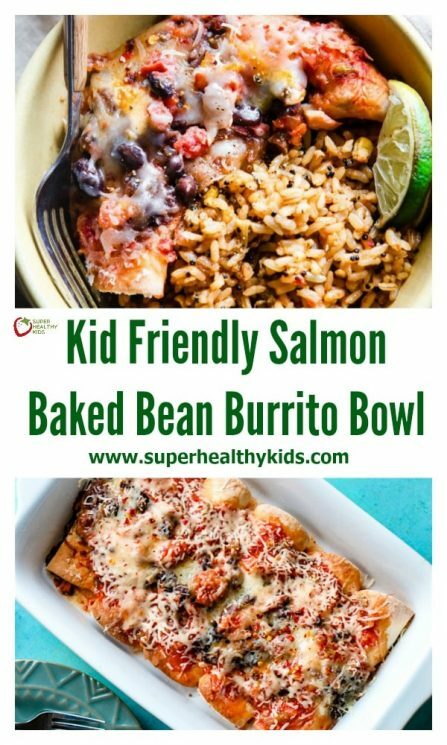 Will you give this Easy and Healthy Salmon Baked Bean Burrito bowl a try? More kid friendly Fish and Seafood recipes for you to try! 1 1/2 cup regular or refried black beans (depends on how you want to prepare them, if you want fast then amy’s brand has canned organic refried black beans). Spray a baking or casserole dish with oil. Go ahead a cook salmon fillets so that they are cooked but not over cooked. If you don’t feel comfortable using fresh salmon, just use 6 to 8 ounce of wild caught canned salmon here. 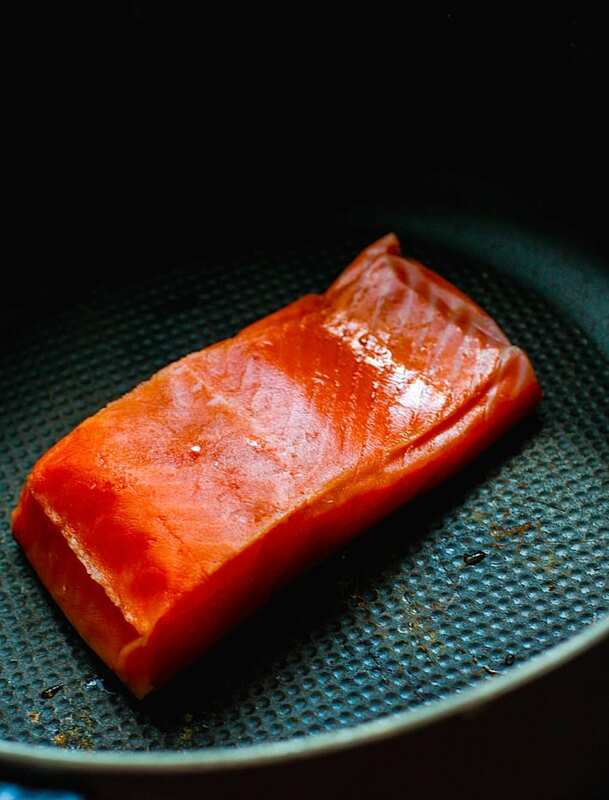 If you are cooking fresh salmon, you can place both fillets in a skillet with 1 tbsp oil and the minced garlic. Cook on medium high heat for 10 -12 minutes or until salmon is light pink and flakes easily. Remove from skillet, place in bowl, and break it apart into small pieces/chunks. add pinch of sea salt and black pepper to salmon. Set aside or place in fridge. Next, cook beans on stove top or microwave if you used canned. Then mix in, cumin, onions , and tomatoes into your pot with beans. Cook for about 8-10 minutes just to make sure the cheese is all melted and mixed in. Remove from heat. Once both bean mixture and salmon is ready, prepare your tortillas. I find it easier to warm the tortillas first, then take each tortilla a lightly pat on olive oil. Scoop 1/4 cup bean/tomato mix and another 1/4 cup or less of the salmon mixture into each tortilla. Roll it up and place in baking sheet. Repeat for about 5 to 6 tortillas. 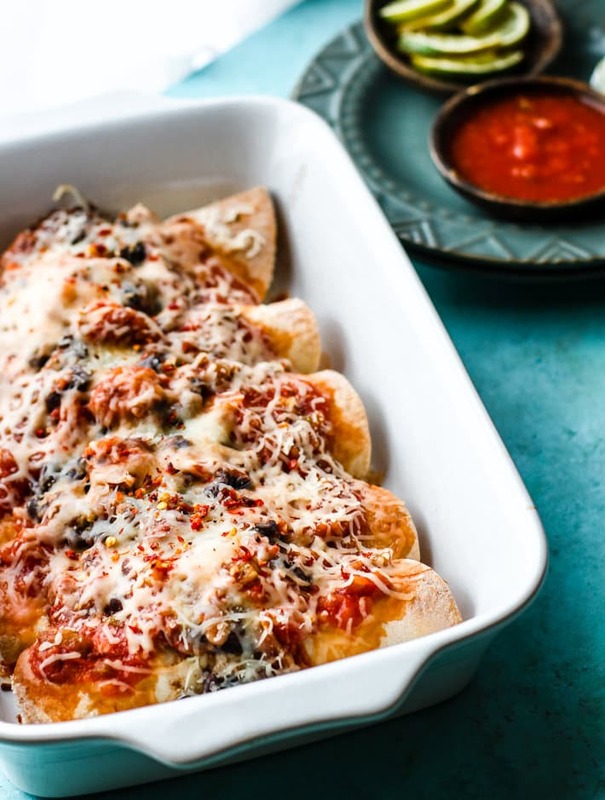 Layer the tortillas with any extra black bean and tomato mix you have left. Then add the extra cheese on top. Bake covered for 15 minutes then uncovered for 10 minutes. You can also broil it for the last 3-5 minutes or so to get it a more golden brown cheese topping. Remove and add thin salsa to whole pan or to each burrito when you serve. 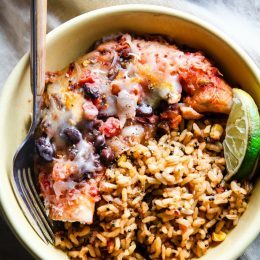 Place each burrito in a bowl and fill the rest with cooked spanish rice and/or corn. You can even add in avocado! Sprinkle a bit of lime juice and pepper and enjoy! Was good, my one year old killed it but the only question I had is how much cumin or did you mean the taco seasoning? oh yes, I meant taco seasoning. Which you can easily add more to if needed. if just using cumin, stick with 1 tsp. thanks for the heads up on that! glad your kiddo liked it!